The flowers at the Lake Mountain trailhead were still beautiful this week. and golden peas in bloom along the roadside. Along the trail, Daisy swam in the algae-laden water trough. Sooo refreshing. We followed a path shaded by aspens, and steep in places. The snow has melted around Gull Lake, where we had a view of Marsh Peak topped by one fluffy cloud. The seasonal lake is full now, surrounded by lush grass and aspens in their spring greenery. On a Lake Mountain ride, this pretty little hawk, a female kestrel, flew from tree to tree, keeping a close eye on us. Kestrels make their nest in a tree cavity. Perhaps she had a nest nearby. While driving up to the Pigeon Water trailhead for another ride, Steve spotted a flicker flying away from a half-dead narrow leaf cottonwood. We stopped for a look, and sure enough, we found a cavity in that tree, and baby birds inside. These were starting to grow feathers, so they were a little older than the buzzing babies in the nest we visited on Pole Mountain. (These also buzzed when we knocked against the tree.) Since this cavity nest is so easy to reach, maybe we can follow up in a couple of weeks with another photo. The flicker mama was anxiously waiting for us to leave, so we obliged. Back at home, our hay was cut and baled last week. Several field mice bit the dust in the cutting. I was looking out the window and saw a hawk on the ground picking at his lunch, probably one of those mice. I'm guessing it's a Swainson's hawk, from the size and coloring. Do you agree? Oh, look, I see something else out in the field. Another hawk? Well, no, but it would probably enjoy a mouse just the same. While riding south of Currant Creek Peak (north of Strawberry Reservoir) , we came to snow and boggy areas. 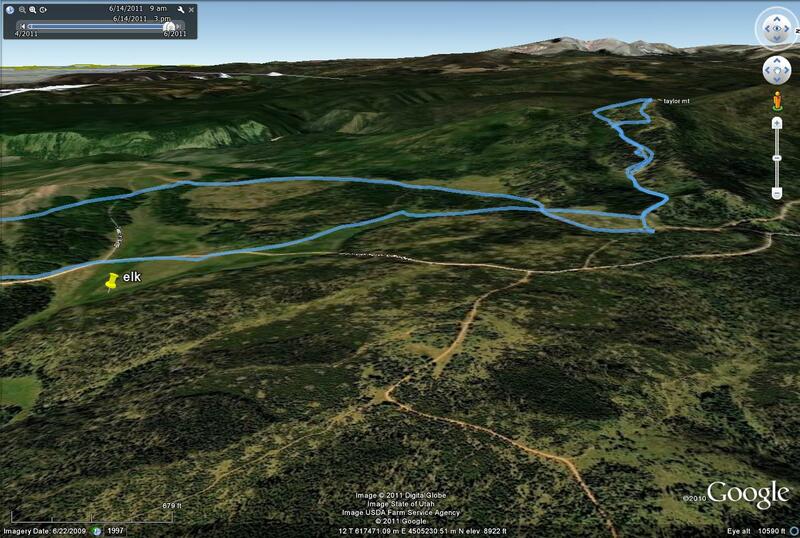 Instead of following our usual route, we dropped to a lower elevation and followed a game trail through the aspen. To the surprise of all concerned, we met up with a herd of elk. Daisy ran toward them, but came right back to us. Maybe she was intimidated by the size of the herd. She acted as an elk magnet. They didn't know what she was and were very curious. The whole group was calling (kind of a cross between a squeal and a crow's caw) at the same time. They were quite noisy. They approached closer and closer, while our horses stood stock still, apparently as curious as the elk were. The elk were so focused on Daisy, they didn't seem to see us. I looked up from my camera and saw a gang of them approaching, no more than 30 yards away. There were spotted calves as well as adults. Unfortunately, I didn't get photos of any of the little ones. Finally, they noticed 2 horses and 2 riders. They reversed direction in a cloud of dust and were gone in seconds. The upper part of the Red Cloud Loop north of Vernal still has locked gates, preventing vehicular traffic. It's open to hiking or horseback riding, though, so we went to check it out, starting at about 9200 feet. We saw elk in nearly every meadow. They were surprised to see us. A moose appeared briefly but we didn't get a decent photo. Daisy had plenty of wet meadows for cool frolicks. The tiny white flowers that cover the meadows are marsh marigolds. Above is a marsh marigold up close. Steve hunted around and finally found a (boreal or western, not sure which) chorus frog, which is so well camouflaged and so wary, that it's hard to find the source of the loud croaks in the small ponds. They're tiny little guys. No wonder they're hard to locate. They don't have webs between their toes, which is unusual. I guess they don't have to swim much in the shallow pools where they live and breed. We rode toward Leidy Peak. About 1.5 miles before we reached the end of the road at Leidy Peak trailhead, we came to deep snow and took that as a sign that we should turn around and head for the trailer. The total ride was 25 miles of incredible high country scenery. It's always good to stop for a meal on the trail. On Pole Mountain, 4 years after the burn, the grass is good and a few alfalfa plants have moved in from nearby fields. The horses love that. Daisy finds a deer spine to chew on. Now that's delicious! Remember the flicker eggs that we found in an aspen tree cavity on Pole Mountain? We went back to see if the eggs hatched. And they did! They're so young their eyes are still closed and they still have egg teeth (hard projections on the beak used to break through the shell.) We didn't see the parents this time, but our reading says that the chicks are fed regurgitated ants for the first several weeks. In reading about flickers, we learned that, when disturbed, the babies buzz loudly, sounding much like an angry hive of bees. Check out Steve's video to hear what we heard. How about that for a survival mechanism? If we hadn't seen a nest there 2 weeks ago, we would have stayed away to avoid getting stung. At the Lake Mountain trailhead located off the Paradise Park Road, balsamroot and larkspur dot the landscape. The narrow leaf cottonwoods are coming to life along Mosby Creek. A morning cloak butterfly lights near the water. Thick patches of gooseberry are in bloom. Up at 9000 ft near Gull Lake, springbeauty carpets the ground beneath the aspens. Marsh Peak, still covered with snow, rises to the north. As we ride back to the trailhead, we see a single Daisy growing... er, resting, in Mosby Creek. We reached the top of Taylor Mountain (9900 ft) last week. shown above. The snow has only recently melted at that altitude. The blue line on the Google Earth map above traces part of our 22 mile loop route. Daisy found one patch of remaining snow to burrow in. The horses took a breather at the top. We took photos of the High Uintas. Sometime this summer, the snow-capped peaks ( 12,000-13,500 ft.) will become accessible. Maybe. On the way down, we saw pasque flowers. The elk saw us, too. Most of them ran away. This mama stopped. Her yearling-sized calf apparently insisted on a quick snack before going anywhere.